CLINTON, Tenn. – Just behind a passing storm front, sodden gray clouds scooted overhead. The dismal light cast a shadow on the Clinch River making it look a bit dull and dreary. 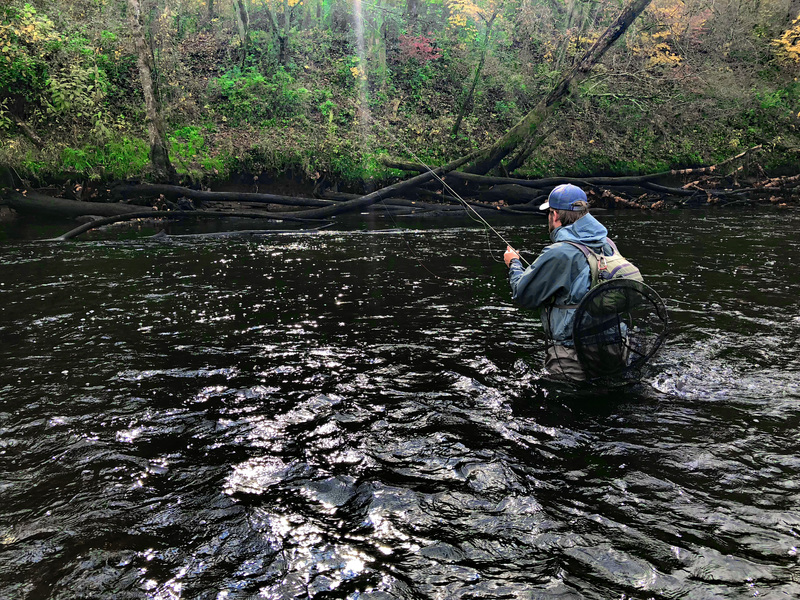 But the rippling current still sang a happy song – at least if you are a trout fisherman. I managed to follow instructions well – this time anyway. The fly settled onto the steely surface, drifted downstream and sinking slowly. The huge trout twitched, opening her mouth just enough to inhale the fly. A second later I found myself attached to the biggest trout I have ever hooked – on the lightest line I have ever used. 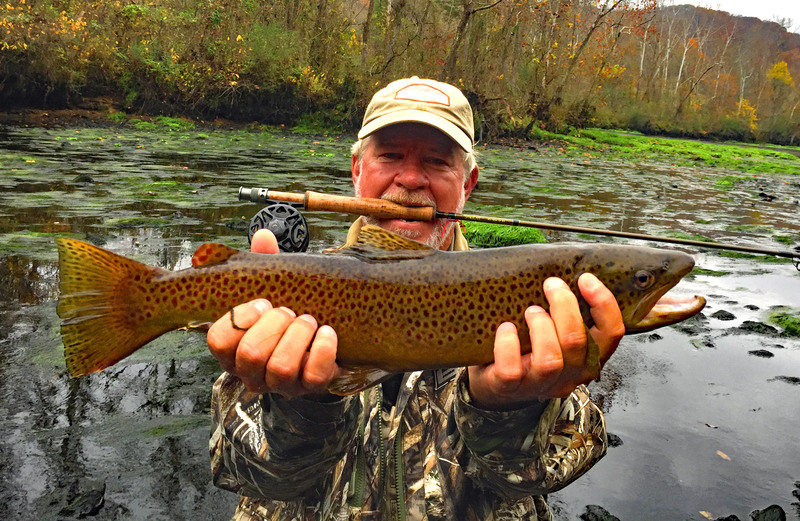 The 3-weight fly rod almost groaned a little as the big brown trout surged upstream, then down. “Take your hand off the reel and just let her run,” exclaimed Mason. A minute or two into the battle however, the fish surged toward a fallen tree. Perhaps a bit too quickly and bit too fervently I cinched down to try and stop the run. The fly line shot skyward like a whip as the nail knot parted and the tippet broke away from the flyline – meaning me and the monster brown trout would each be going our separate ways. 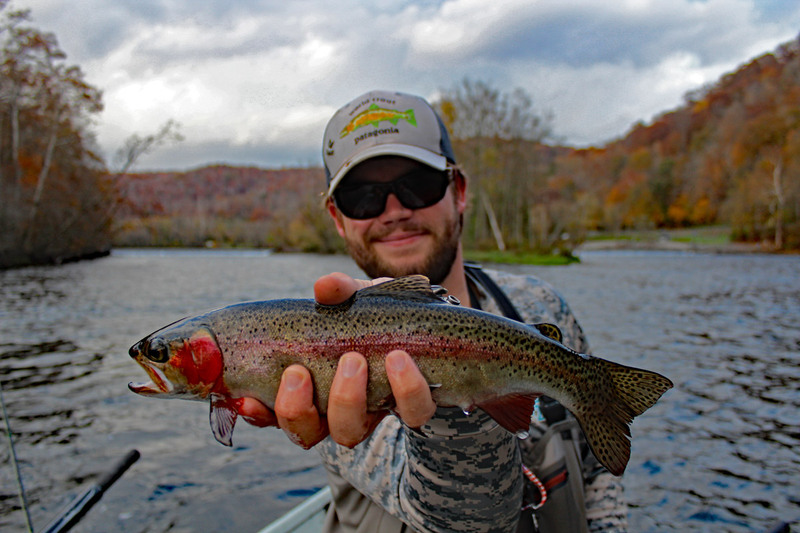 It was clear to me that this young man had a future as a trout guide. 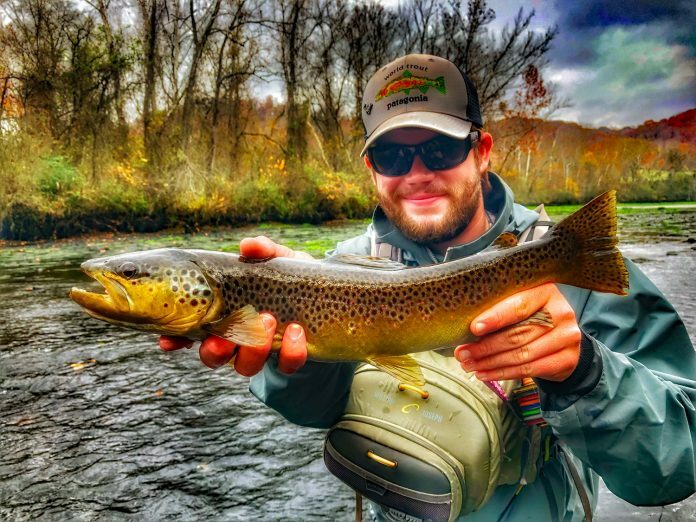 Sims just recently hung his shingle as an East Tennessee trout guide out of Hiwassee Angler in Charleston, Tenn. I first met Sims by chance in January 2015. He was floating in a belly boat on Lake Junior. The lake was halfway frozen over but the young man didn’t seem to notice the icy water. On shore his father explained that Sims was a member of the USA Youth Fly Fishing Team and he was preparing for an upcoming competition. He and his team had just recently brought home a gold medal from a competition in Poland. His resume has grown since. 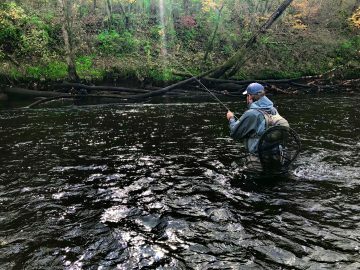 “I’ve competed in Ireland, Poland, Colorado and most recently in Spain for the World Fly Fishing Championship,” said Sims, who has lived, eaten and breathed trout fishing for half of his young life. Back on the river I urged Sims to show me how it was done. I watched and marveled as the young man put on fly fishing clinic. Of course he had found the perfect place for such a clinic. We had happened upon a Mother Lode 60-yard stretch of the Clinch that was holding as many as a dozen trophy brown trout. With the keen eyes of an experienced trout man, Sims pointed out each fish and instructed me on which one to cast to. With the required patience of a guide, Sims kept coaching and I added a couple of big browns to our trophy list. Of course all were released. Spending most of his life focused on catching fish himself, Sims admits that guiding brings a new and sometimes more difficult perspective to his fishing. Building the fledgling business requires patience as well. “I’m definitely on the ground floor. But we’ve got a lot of interest going,” he said. 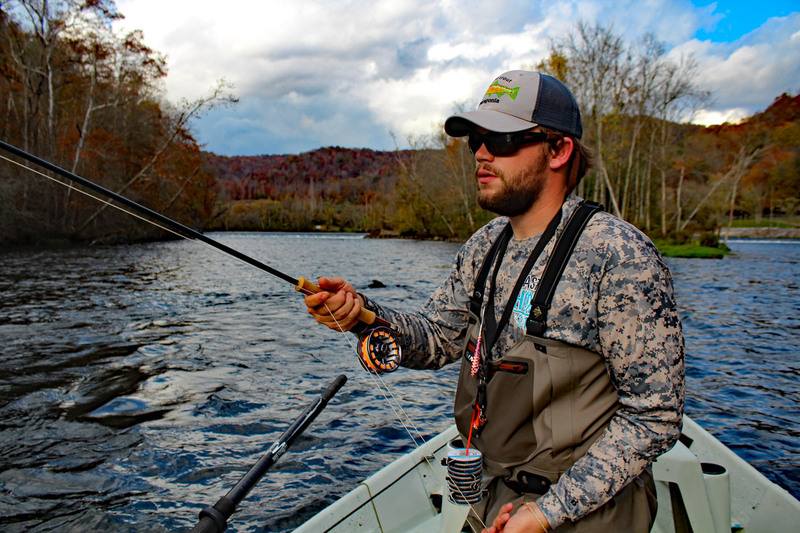 In spite of the business name, Hiwassee Angler, Sims cannot actually guide on the popular Hiwassee River yet. 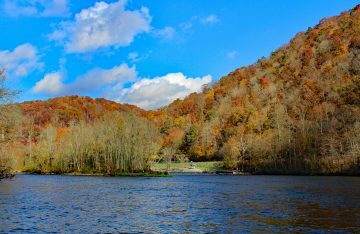 The U.S. Forest Service keeps tight reins on the number of businesses it will allow to operate in the Cherokee National Forest (which includes the Hiwassee River). 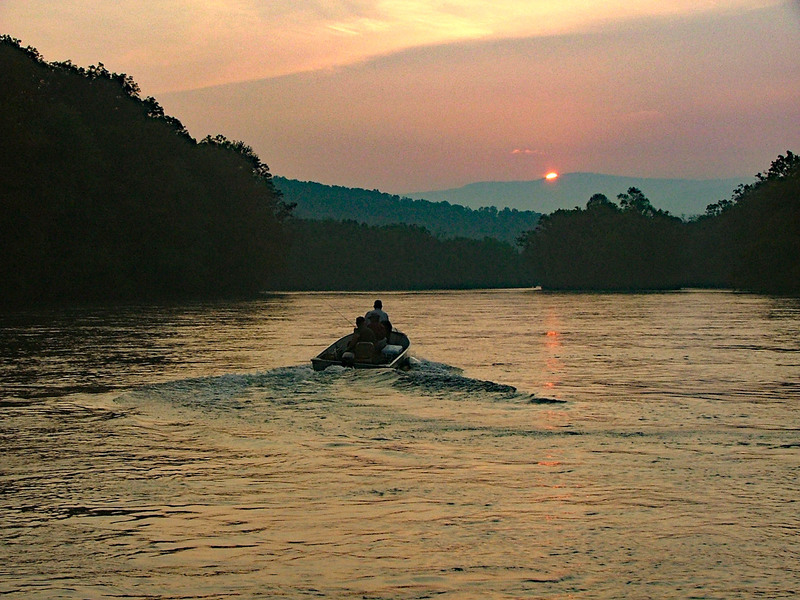 To become permitted to operate on the Hiwassee can be a lengthy and bureaucratic process. Sims and his boss, however, are always happy to share fishing reports, fishing tips and gear to anglers who are heading to the Hiwassee on their own. For now Sims says he will be guiding primarily on the Clinch River, Toccoa River and Noontootla Creek (in North Georgia), as well as Cherokee and Soco Creek in North Carolina. 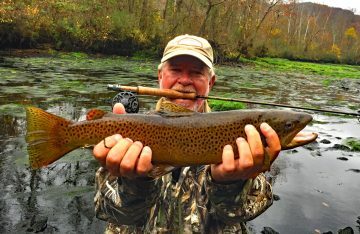 “Soco Creek is not really well-known but there’s a lot of big trout in that creek as well as a lot of pretty wild fish,” said Sims. Back on the river TVA turned on a power generator at Norris Dam just upstream. Soon the river began flowing faster and higher. Sims and I launched a drift boat, switching from wading to drifting. That meant no fishing for Sims as he was constantly rowing to position and re-position the boat. The morning storm clouds rolled away and bright patches of blue dotted the sky. Thirty seconds later my strike indicator jiggled and then buried itself underwater. I set the hook and one of the purest, most colorful rainbow trout I have ever seen skyrocketed into the afternoon sunlight. Most of the trout TWRA stock in the Clinch go into the river as tiny fingerlings. 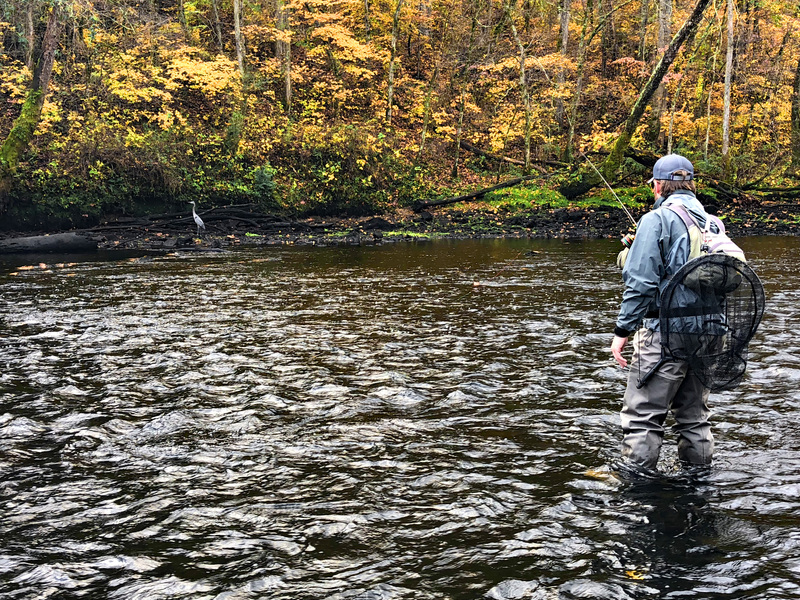 They may not be wild trout in the truest sense, but they have lived most of their life far from a concrete raceway – looking and acting more like wild trout than they do the typical “stockers” placed in many streams. Sims and I marveled at the deep, rich colors on the beautiful fish. “Being out here in God’s creation is just a gift that I can’t even begin to explain,” said Sims. Even if he can’t explain it, Sims is looking forward to showing people what he means. He says he will be happy to accommodate folks who might want to buy a trout fishing trip as a Christmas present for friends or family. They provide all your fishing tackle and waders. They also provide lunch on full day trips. 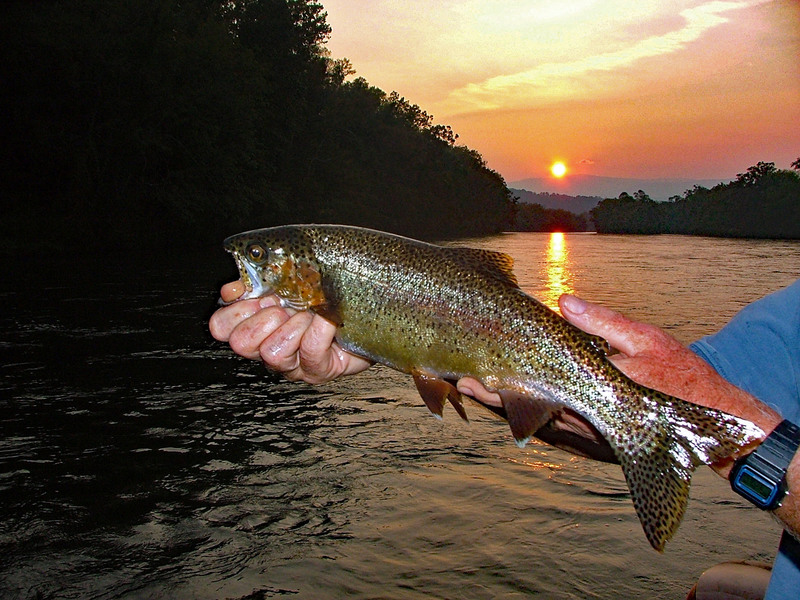 You can reach Sims by calling 423-758-FISH (3474) or check out Hiwassee Angler on Facebook.